Although a relative new comer to the high-end audio industry, veteran recording engineer, producer and musician George Counnas has been around music production for decades. He now takes on the role as chief designer at Zesto Audio. Unhappy and uninspired with the performance and sound of many components he'd experienced, Mr. Counnas set his sights on designing and manufacturing high-end tube components that were in alignment with his knowledge of what music sounds like. Their first component, the critically acclaimed Andros PS1 Phonostage is already a classic -- despite being on the market less than 3 years. The Leto PreAmplifier, their next component has also received wide acclaim from music lovers and reviewers alike. Their third offering, the BIA 120 Class A stereo tube amp completes George's trilogy of components, manifesting a true system approach. Not to be outclassed by its siblings the Andros and Leto, the BIA 120 is already garnering raves and was recently declared to be the "best amplifier ever experienced in 50 years". The Andros Phonostage received a 2013 “Class A” Recommended Component from Stereophile & has been named a runner-up for Stereophile Analog Component of the Year. The Zesto had an addictive, warm overall sound, with plenty of impact, detail and grace. I highly recommend the Zesto Andros PS1. It’s among the more enjoyable and satisfying phono preamps I’ve auditioned at any price. Fussy can be good. Zesto Audio's President, George Counnas, has loved music all his life — as a musician, record producer and audio engineer. He says, “It’s made me fussy about sound. That’s a good thing.” We agree. “Digital technology has its place, but true audiophiles know that for the truest, purest sound, nothing beats analog. As I returned “home” to the warm, wonderful world of vinyl, I looked for the gear that would deliver the highest fidelity. I wasn’t satisfied. So I built my own. “Vacuum tubes faithfully convert the delicate signal from my turntable and bring warmth and harmonic tonality like nothing else can. “As a young man in England, I designed vacuum tube circuits. I worked for DECCA Navigator — at the time Britain’s largest electronics company — as part of a research and development team designing airborne navigational systems for the Royal Air Force. “So I have many years of experience designing, creating and bringing to market high-end electronic equipment. The difference here is that no one’s life is at stake. “I started doing research on past phonostage designs going back to the original RCA circuits of the 1930’s. These guys got a lot of things right, even though their tools were slide rules and trial and error. “Their ‘classic’ designs were my starting point. “But I had the advantage of CAD software to simulate electronic circuits. Ah yes, the old and the new. But even with the engineering skill, history, technologies, in the end it’s designed by how it sounds, by ear. “One year later, after 71 circuit revisions with hundreds of component upgrades, I have a phonostage that I am proud to put my name on. It gives me joy to listen to music. “The Andros PS1 Phonostage is my baby. I compromised on nothing. “The resisters are very quiet, the capacitors are transparent, and the transformers have minimal distortion. To make sure its visual aesthetics lived up to its sound, I had an industrial designer (Musky Mistry) and an artist (Carolyn Counnas) collaborate to create an elegant enclosure that’s built like a tank. George Counnas clearly put a lot of heart, soul and mind into his Andros PS1 Phonostage. Once you hear what this thing can do, you’ll understand why. Wes Bender Studio NYC is thrilled to recommend the Zesto Audio Andros PS1 Phonostage. Zesto makes uncompromised audio components that are also an outstanding value. Hear it now at WBSNYC. "Its sound is unbelievably smooth and velvety; harmonically rich, full, and vividly textured; marvelously rounded, tactile, and dimensional, with great body and solidity; and completely natural in its musicality and freedom from any of the usual sonic hype, audiophile style." "The sweetness and delicate nature of the Zesto Andros PS1’s delivery in the midrange and highs are almost counter-intuitive to its ability to also very competently amplify and deliver the sheer, explosive low frequency energy and dynamics that the record playback system sends to it." The system, put together by Zesto, Lindemann, and retailer Audio Revelation, was absolutely jaw-dropping in its presence and realism. In fact, the Andros PS 1 made his "Best of Show"/"Best Sound (cost no object)". "At its price, its performance competes with much more expensive units. In appearance and sexiness, there’s nothing that comes close." " It’s physically beautiful, adaptable to many different cartridges by merely accessing the switches on the back panel, and most importantly, it will do real sonic justice to your valuable vinyl collection." "Owning a phonostage with state-of-the-art sonics? Wonderful! Owning one with balanced circuits and infinite adjustability? Outstanding! Having those adjustments not be tiny, cheap dip switches but high quality knobs and switches on the BACK so you don't have to open the case to make adjustments in real time? Amazing! Having it look like it belongs in a Museum of Modern Art? Unbelievable!" wow!!! The PS1 is sensational! At 50 hours it was terrific. But after 175 hours of around the clock burn-in, I’m climbing the walls with excitement! The Jensen transformers alone blow away my last reference... As for the overall design, I’m truly hearing more stuff in my recordings than I’ve ever heard before! I could go on and on with all kinds of adjectives to describe the performance of the PS1. But since you’ve heard them all from others, I’ll just get back to some enjoyable listening. Congratulations to Zesto Audio for a great design achievement! You can see a theme here. You can hear what they’re talking about here at WBSNYC! Inspired by RCA’s vacuum tube circuit designs from the 1930s, the Andros PS1 has been engineered to bring you the clarity and depth of the original recording. Your highs will be crisp but not overly emphasized, your midranges clear and present without being shrill and your lows full and firm without being boomy. Words are inadequate to the task of explaining the Andros PS1. You simply must hear it to believe it. The Circuit is specifically designed to provide sufficient amplification to match your cartridge with the rest of your system. Each unit is hand built "Made in the USA". A low Noise level of -75dBu allows the quietest passages of you music to be heard. Dimensions 17" W X 12" D X 5" H Weight 20 lbs. 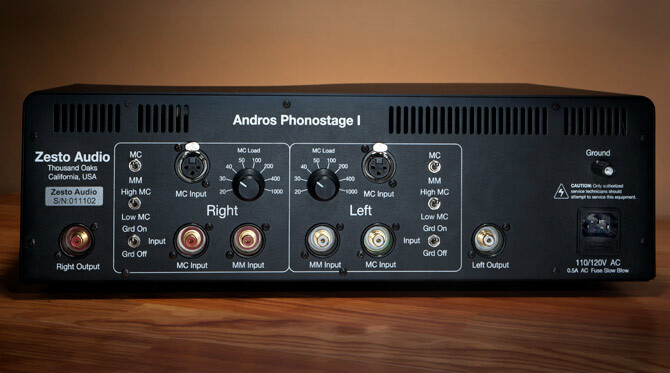 In 2011 we introduced our debut product, the Andros PS1 Phonostage. We have been gratified by the glowing reviews, industry awards and enthusiastic acceptance by audiophiles. Now we’re pleased to announce the Leto preamp, born of the same sonic bloodline: warm, musical and very quiet. As a longtime audio engineer and producer, I’ve worked with a lot of professional equipment. I always preferred “true floating balanced” inputs and outputs because of their foolproof ability to isolate one piece of gear from the next. And that means lower noise for a strong, clean and quiet signal. The Leto preamp will compliment any system: tube, solid state or digital. It will work with single-ended and balanced input source or power amplifier combinations. Each unit is hand built "Made in the USA". New from Zesto Audio comes the tubed Leto Preamp, pushing the envelope in value and performance in its price range and beyond. With styling similar to the Andros Phono stage, the Leto is a powerful sounding, highly detailed, fantastically quiet, and superbly musical masterpiece that will complement the finest systems. Designed by a brilliant and pragmatic designer who knows great sound and ergonomics, the Leto performed like a thoroughbred in every way musical, and was a joy to control and adjust. The fun factor while working with the Leto made me rethink what has been missing in minimalist preamps that cost even more money these days. What a jewel! The Zesto Audio Leto is a killer design to my way of listening and loving recordings, and may just be the preamp you will buy and keep for the very, very long haul. The Leto receives my highest recommendation. To get the whole story, read the entire review or give us a call to schedule a listening session! I am flabbergasted. The more I listen to the BIA 120, the more I am certain this magnificent amplifier is the real McCoy! 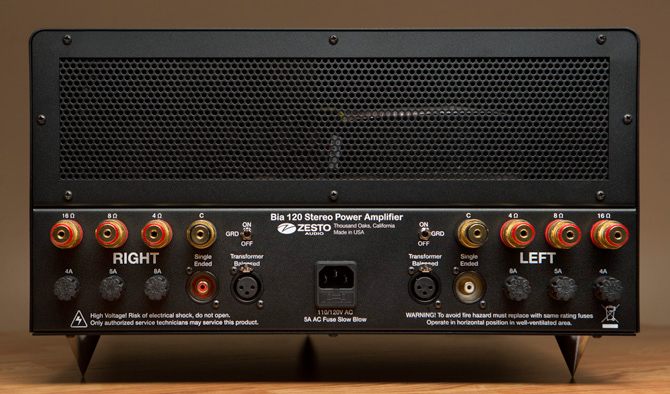 The BIA 120 is a state-of-the-art tube amplifier. The BIA 120 has superb clarity, depth, neutrality, realism, nuance, elegance, and ultimate definition that a great tube amplifier should have. It has the kind of snap, low distortion, freedom from noise and haze, tight fast bass, speed, and slam you would expect from great solid-state amps. It has none of the troublesome problems or sonic artifacts of either tube or solid state designs. It is neutral like no other tube amp has ever been in my experience. It is a wonder! Zesto has created an amplifier that, when placed with the best ancillaries, will give you the experience of the musical performance with ground-breaking intense realism. The only things missing will be the sticky floors and the expensive tickets. I have never heard a better amplifier in my reference system, tube or solid-state. It is the best new tube amplifier to reach the market in the last five years priced under $50,000. That it costs $12,500 is a boon to audiophiles everywhere, and a minor miracle. What a value! With my pro background in the recording studio and live concert mixing, I wanted to build an amp that allowed me to hear music the way I know it should sound. I wanted it to be easy to use, reliable and with plenty of power to drive the speakers. In short, I wanted power without compromising the music. I choose a Class A Ultra-linear, Push-Pull circuit design to deliver the most precise, enjoyable and faithful reproduction possible. The unsung hero of a power amp is its power supply. That’s why my design incorporates a custom Toroid power transformer and a choke-based, dual-mono power supply–to deliver all the “slam” you can handle. With Auto Bias, you need no adjustments. It’s safe, consistent and the settings are always perfect so you can enjoy your music. In Greek mythology, Bia is the Titan Goddess of force and power. Each unit is hand built "Made in the USA"